The August 2018 flood that devastated Kerala was one of the most ruthless adversaries K. Krishnamma ever faced. But, her days at a relief camp in Alappuzha stirred the 35-years-dormant basketball player in her. The camp inmates cheered at the beautiful dribbling and perfect shots of the former star, who represented Kerala in three mini-basketball championships, and even got selected to the national team (Krishnamma couldn't join the team because of a bout of illness). Krishnamma is the sole breadwinner of her family. She is now a daily wages cook at an upper primary school in Thakazhi, Alappuzha. When she went back home from the camp with her three children and an ailing husband, S.S. Prakash, she found nothing but added woes. “The walls of our house have become soft and it may crumble anytime,” she said. She lost everything, including her bank passbook, Aadhaar card and even the house ownership records. THE WEEK featured her story in the Big Picture section (September 16 issue). She had to start from scratch, and eventually, the much-needed rebound in her life came from the sport she loved. Team Rebound, an organisation of around 400 basketball veterans in Kerala, formed in December 2016, traced Krishnamma and offered her Rs 3 lakh. 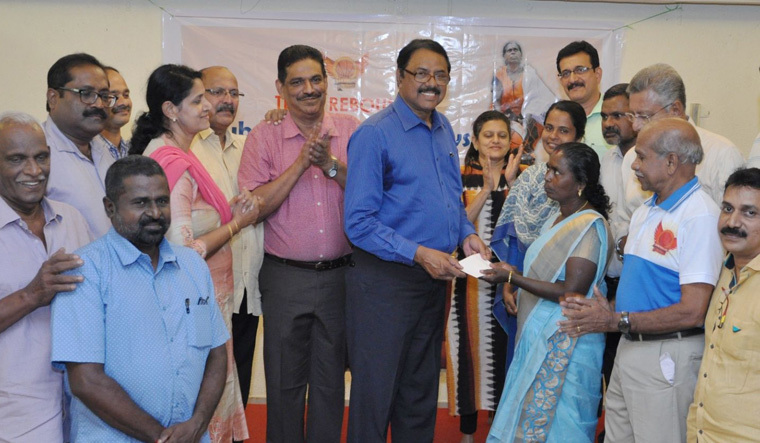 In an event at the Regional Sports Centre, Kochi, on September 6, the first instalment of Rs 50,000 was handed over to her as immediate assistance. “When we asked her about constructing a new house, Krishnamma told us that she just needed the money to erect a small shed where her family can stay temporarily,” said A.M. Iqbal, president of Team Rebound. Krishnamma hopes that the government will help them rebuild their lives. Iqbal said that Team Rebound will hand over the rest of the funds, as the needs arose. The group has collected over Rs 5 lakh for the relief works. “The amount we raised shows we still have the team spirit that we learned through the sport,” said Iqbal. Shaji Malikel (known in court as Kappani), a member of Team Rebound, was the one who painstakingly traced the address of Krishnamma. Leelamma Santhosh, former Indian captain and vice president of Team rebound, pointed out how the game Krishnamma loved has, in fact, become a game-changer in her life. When THE WEEK asked Krishnamma's husband Prakash whether he knew about her basketball skills, he said that he didn't know much until she displayed it during the camp days. “I used to tease my wife that she might have been a ball collector,” Prakash said emotionally. “I never knew that she could play basketball.” Krishnamma said it was sweet revenge for her to prove in front of her husband and children that she was a basketball player. Prakash suffered from a cardiac arrest four months back. His angioplasty has been postponed, given the expenses involved. Krishnamma too suffered a minor heart attack two years back. But, she is more concerned about her husband and children. “Both of us cannot fall ill at the same time. If that happens, who will be there for our family?” she asks. But, Team Rebound assured Krishnamma that she would receive all help. 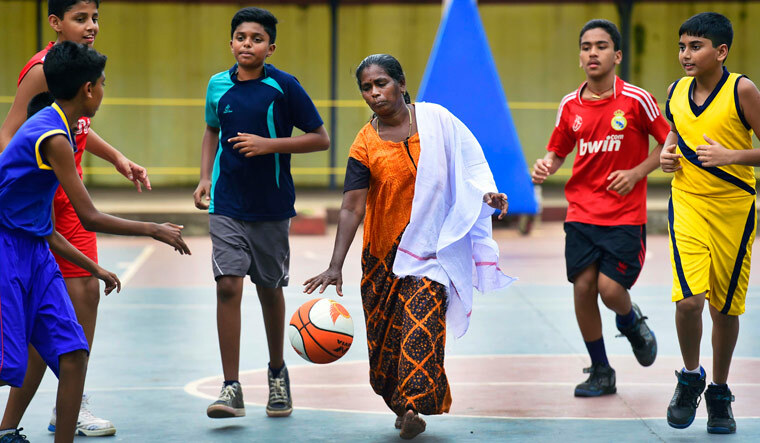 The group is planning to renovate a basketball court near Krishnamma's house in Thakazhi, where she can coach those interested, and earn some extra income.